Wesley So Wins Quebec Chess Championship. 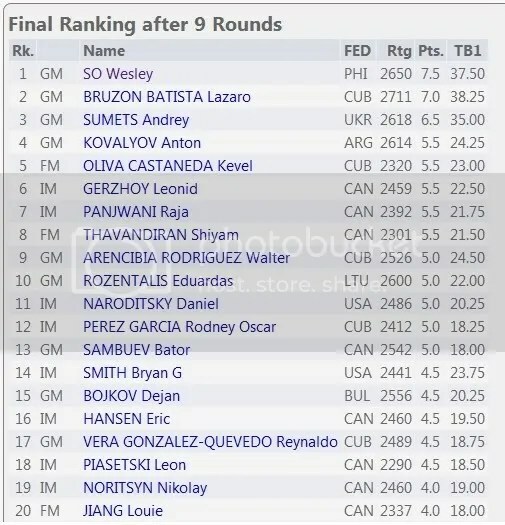 When it rains, it pours and that’s how to truly describe International Grandmaster Wesley So masterful invasion and back-to-back conquests of Toronto and Quebec Chess Championships in a matter of 14 non-stop days and a total of 16 gruelling rounds of exciting chess !!! The Quebec Open Chess (QOC) Championship Invitational Section, was a 9-Rounds “Standard” Swiss that took place from 21st to 28th July, 2012, at the beautiful venue College Brebeuf in Montreal, Canada while the 2012 Toronto International Championship as previously reported, was a 7-Rounds “Standard” Swiss Event held on 15-20 July. QOC, a distinguished and most successful annual tournament in Canada invited and gathered for this year event 32 FIDE rated players (9-GMs, 10-IMs, 6-FMs & 1-WGM) from 9 countries (Argentina, Bulgaria, Canada, Cuba, Lithuania, Philippines, South Africa, Ukraine & USA) for the ‘Invitational Section’ with a top prize of $4,000 for the first placer. GM Wesley So, the Philippines top board player for the August 27 to September 10, 2012 World Chess Olympiad in Istanbul, Turkey stamped his class, finishing sole 1st place by scoring 7.5/9 (6Wins & 3Draws) and registering a performance rating of 2789. Wesley, the 2nd seeded in the tourney had a ‘neck and neck’ battle for the lead with the nr-1 seed, the World’s 35th ranked GM Lázaro Bruzón Batista CUB(2711) i.e. as they approached round 9, the finish line, they were tied at 6.5/8 but GM Bruzon Batista had the upper-hand with a higher tiebreak points. One interesting to note was the top two seed players had a truce in round 4 where GM Wesley So had preserved his ‘No-Loss’ record to-date against 2700+ players in ‘Standard ‘ chess (i.e. 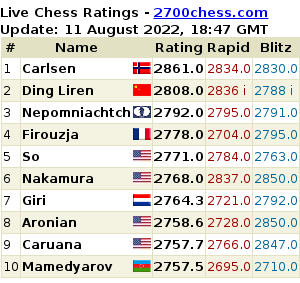 the players were officially @ 2700+ FIDE rating at the time when he played against them). 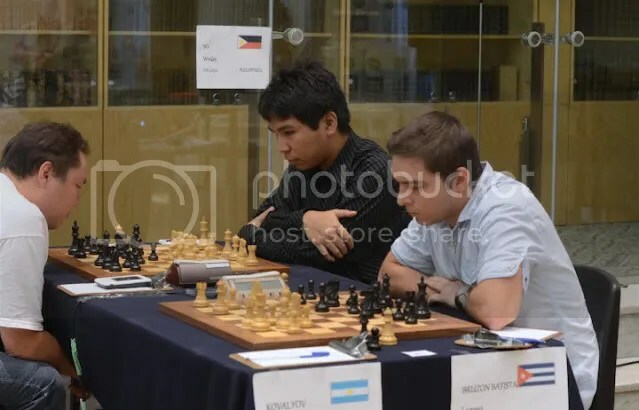 In the last round, Hyper GM Lázaro Bruzón Batista was held to a draw by Super GM Anton Kovalyov ARG(2614) while Super GM Wesley So defeated Canada’s Top Board player for the 2012 Olympiad GM Bator Sambuev in an exciting and suspenseful 75 chess moves to win the tournament by half point. GM Wesley So next stop will be the Chess.com’s 7th Blitz “Match of Death” that will take place on Sunday, July 29th at 3pm Pacific (6pm Eastern) time. The match is set to feature the highest rated player in Filipino history, Grandmaster Wesley So, against the youngest Grandmaster in American history, Ray Robson. Mark Paragua Wins Philippines Championship 2012. 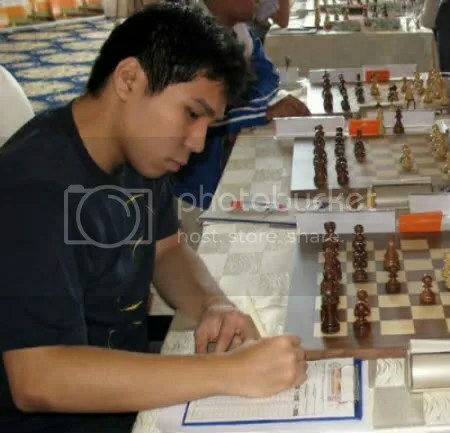 Grandmaster Mark Paragua, the 6th Philippines International Grandmaster (2005), the former Philippines’ nr-1 chess player, and the first Filipino to breached the super GM status at 2600+ mark (2618 in Jan 2006) at age 21yrs-9mos-2days, won the 2012 Philippines National Chess Championship, in an impressive fashion, held 15-25 July in the beautiful, scenic and world renowned tourist destination the tropical Island of Boracay (1st half) and at the Cabagnot Training Center, Old Buswang, Kalibo Aklan (final half). The Philippines National Chess Championship is a yearly event and starting 2009, sans 2008, was dubbed as the Battle of Grandmasters (BOGM). The previous four BOGM (2008, 2009, 2010 & 2011) were won consecutively by Philippines top GM Wesley So and in this year event, the 5th BOGM, was undoubtedly won by the resurging pride of Meycauayan-Marilao, Bulacan, Mark ‘Mac-Mac’ Paragua … “The Executioner” as depicted in Chess Piece by Bobby Ang of bworldonline.com. 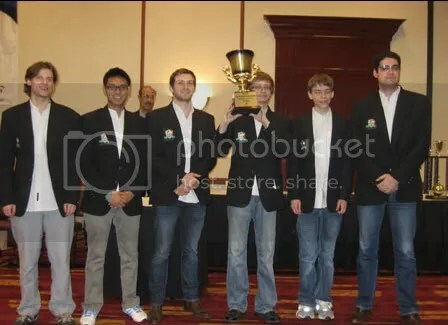 (Note: The 1st BOGM was not recorded as Philippines National Chess Championship). This year event is not just about being declared as the National Champion and awarded the top prize of Php 150,000 but at the same time clinching one of the three slots allotted to the top 3 winners to represent the country in the forthcoming 40th World Chess Olympiad to be held in Istanbul, Turkey on August 27 to September 10, 2012 as member of the Philippine National Chess Team (Open/Men). 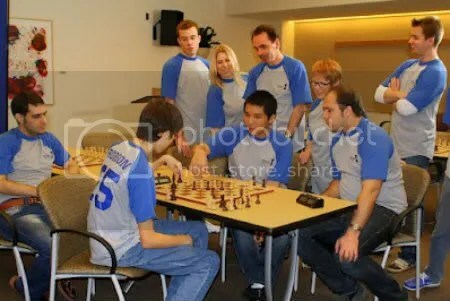 GM Wesley So, the Philippines top player, who is currently processing his U.S. Student Visa for a chess scholarship at Webster University, St. Louis, Missouri and also at the same time campaigning in Canada was already guaranteed the top Olympiad slot. The fifth player, will be picked by National Chess Federation of the Philippines (NCFP). 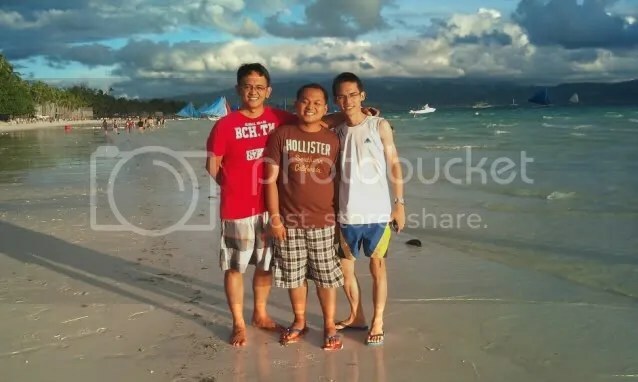 GM Paragua in route to his first ever National Chess Championship trophy, initially, had a rough sailing on the white beaches of Boracay on the 1st half of the tourney where he incurred his only two losses at the hands of IM Oliver Dimakiling in round 2 and another against GM Rogelio ‘Joey’ Antonio in round 6. But after that he was able to adjust on time and rotate his sailboat ‘boom’ and steered it’s ’tiller’ (steering wheel) towards the right direction and had a smooth sail winning the race, scoring 11.5/15 (10Wins-3Draws-2Losses) with a performance rating of 2627. His NCFP ‘Scoring System’* final score was 23 points, a +2.5 points ahead the second placer. 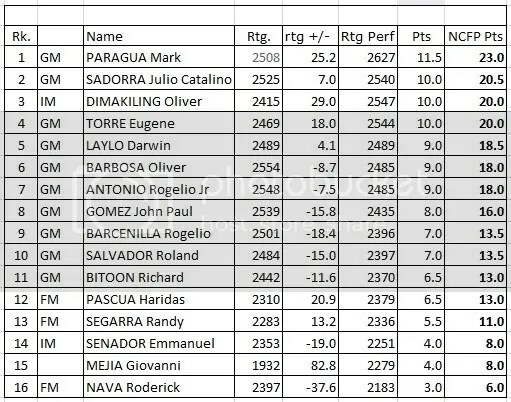 GM Julio Catalino Sadorra, the 14th Philippines International Grandmaster (2011) and a mainstay of University of Texas at Dallas chess team ( 2012 second placer in the US Final Four of Chess), proved his worth finishing solo at 2nd place scoring 10.0/15 (8Wins-4Draws-3Losses) and a 20.5 points NCFP score, to grab the second ticket to Istanbul 2012 Olympiad. 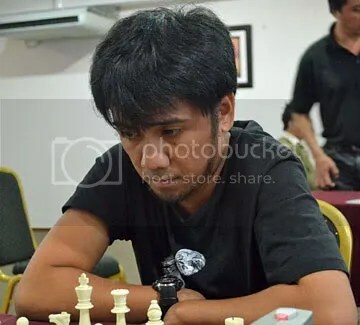 IM Oliver Dimakiling (9Wins-2Draws-4Losses) and Asia’s First GM Eugene Torre (6Wins-8Draws-1Loss) scored 10.0/15 each and also tied at 20.0 points NCFP score but Dimakiling was awarded the last of the 3 tickets for the 2012 Olympiad with a higher tiebreak points than Torre. 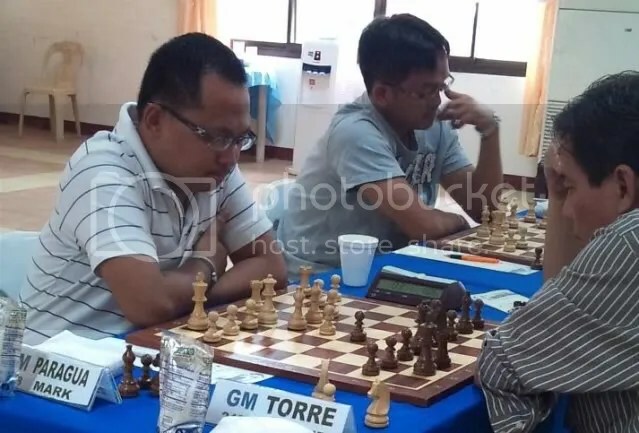 GM Darwin Laylo, who was still in contention after round 14 results lost his stride against GM John Paul Gomez in the final round finished 5th place with 9/15 ( 6Wins-6Draws-3Losses) and 18.5 points NCFP score. Note: *The ‘NCFP scoring system’ or more known as ‘Torre-Pichay scoring system’, scores 2-pts for a Win, 1.5-pts for the player forcing stalemate, 1-pt for a draw, 0.5-pt for a player not able to move ‘stalemate’ and zero for a loss. 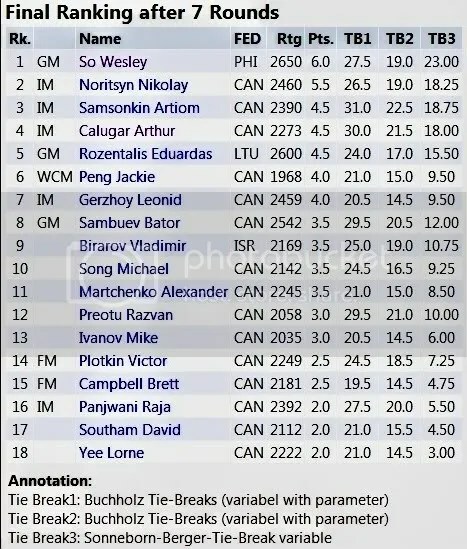 Wesley So Wins 2012 Toronto International. To be a Top-seed in 2012 Toronto International Chess tournament is ‘no walk in the park’, as the expectation is at the uppermost, but Grandmaster Wesley So, the Philippines’ nr-1 chessplayer and the only player guaranteed a slot in the Philippines Open/Men National Team to the 2012 World Chess Olympiad 27Aug–10Sep in Istanbul, Turkey by the National Chess Federation of the Philippines (NCFP), lived up to his billing by winning the Crown Section of the 2012 Toronto International Chess Championship held 15-20 July at the Annex Chess Club, 918 Bathurst St., Toronto, Canada. 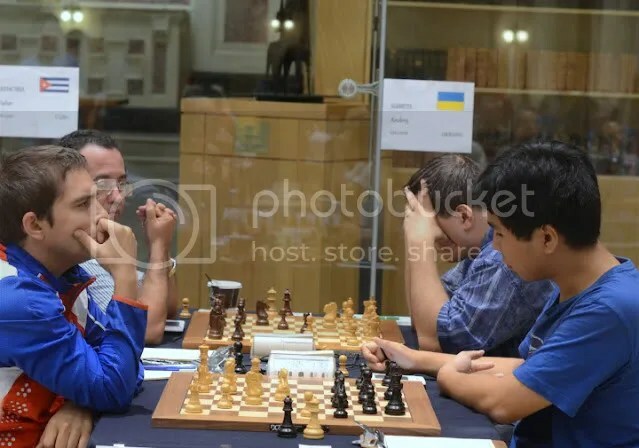 The Crown Section, hosted by Chess Institute of Canada is a FIDE Rated 7-Rounds “Standard” Swiss Event, was participated by 18 rated players (3 GMs, 5 IMs & 2 FMs) from 4 countries (Canada, Lithuania, Israel and Philippines). GM Wesley So started without let-up storming the field despite great opposition from a bunch of Canada’s top rising and talented junior star players winning 3 straight rounds in a row before drawing the 4th round, then again, winning the next 2 rounds and finally nailing a solo 1st place and the top prize of $4,000 by agreeing a peace treaty with the tournament’s giant killer IM Arthur Calugar CAN (born 1994), who in previous rounds had slewed the two other GMs. Wesley’s penultimate round-6 triumph against Tournament’s Nr 3 seed and Canada’s 3rdhighest rated GM Bator Sambuev was a big win and a breather prior to his last round truce with IM Calugar to secure as the overall champion with a score of 6.0/7. IM Nokolay Noritsyn CAN scoring 5.5/7 finished 2nd placer followed by IM Artiom Samsonkin CAN (3rd), IM Arthur Calugar CAN (4th) and Lithuania’s Nr 1 Super GM Eduardas Rozentalis (5th) who all scored 5.0/7 and their final standings were determined by tie-break points. 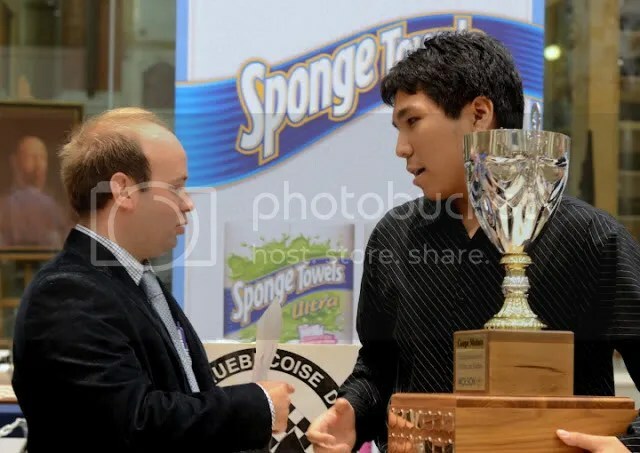 GM Wesley So next stop will be the much tougher Invitational Section of the Quebec Open Chess Championship scheduled to take place from 21st to 28th July 2012 in College Brebeuf, Montreal, Canada. On the distaff side, Webster University’s Chess Coach GM Susan Polgar (U.S. Top College Chess Coach) kibitz at chessgames.com on 19 July 2012, informed Barangay Wesley (BW) that “Wesley has passed his entrance requirements to Webster University!” and will be enrolling for the Academic Year 2012-2013 along with the other 7 Grandmasters that include GMs Georg Meier (Germany) & Ray Robson (USA). Wesley’s mom Leny So also had informed, in my recent chat with her, that her son passport is now with the U.S. Consulate in Toronto for his Student Visa application. Barbosa Bags 2 Silver Medals in Vietnam National Blitz Chess. GM Oliver Barbosa, the Philippines’ second top rated player in the latest July 2012 FIDE rating list, made a quiet, secret and triumphant invasion of Vietnam just very recently, at the 2012 National Rapid and Blitz Chess Championships, it’s 17th edition, in Ho Chi Minh City, Vietnam from 5 to 10 July 2012 where he participated in two events and bagged two Silver Medals in the Men’s Blitz and the Final Men’s Blitz Team events. In the Men’s Blitz, Barbwire, actually tied for first with Vietnam’s 2nd best player GM Nguyen Ngoc Truong Son, who both scored 11 points after 13 rounds of blitz chess. GM Nguyen Ngoc Truong Son won the Gold with a higher tiebreak points in his 10win-2draw-1loss effort with GM Barbosa settling for the Silver medal with his 11win & 2loss record. 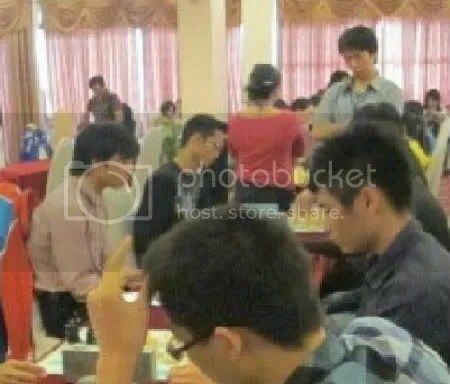 It was a catch up game for the “Lone Ranger” (the only foreign player, in Vietnam’s 17th National Rapid and Blitz Chess Championships), who after absorbing two successive losses in Round 5 & 6 to Hoang, Canh Huan and GM Nguyen Ngoc Truong Son respectively, had to win all the 7 remaining rounds to tie for first and cope the silver medal. GM Barbosa, added another Silver medal when he anchored his team, QDO (Vietnam’s Army Chess Team) to second place in the Men’s Team Blitz. He contributed 4 straight wins, a perfect 4/4 points, in this event for his team. 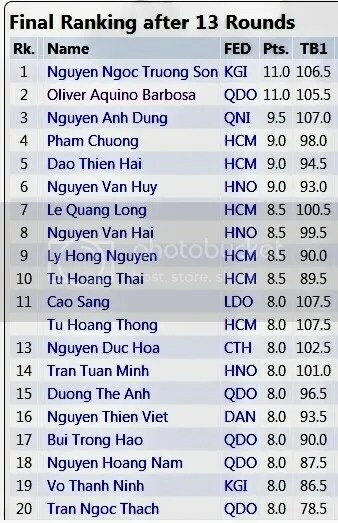 Barbosa’s participation in Vietnam’s 2012 National Chess Event, with more than 140 chess players, including 65 women, from 14 cities and provinces was sponsored by Vietnam Army’s QDO Team.